Trust Seton to provide reliable and cost-effective safety storage solutions for your facility’s flammable and combustible materials. Our extensive selection of flammable safety cabinets include standard, tower, compact and many other brands. All the guidance you need is provided below. If you need further assistance, please call 1-855-972-7716 and one of our product experts will guide you to the right solution. You can also check out our line of safety storage cabinets here. What’s up with the color? Pay attention to the color as safety cabinets are often color-coded according to their purpose. Most facilities use numerous types of chemicals, and color-coded cabinets are an efficient way of sorting them out. In case of fire, emergency responders will also be able to easily identify the type of fire extinguishers to use just by looking at the cabinet color. Storage cabinets specially designed to accommodate gasoline, aerosols and flammable liquids are often colored yellow for easy identification. What style is best? Seton’s offering of flammable cabinets include styles and sizes that can accommodate capacities ranging from 4 gallons to 90 gallons. Aside from the Standard style cabinets that are offered in the most popular sizes, there are also the Benchtop, Slimline, Undercounter, Piggyback, and Wall-Mount cabinets. If you’re dealing with small quantities of flammables at point-of-use applications, space-saving styles such as the Compact are the best for you. For limited floor space, the narrow Slimline flammable cabinets are gonna be ideal. There’s also the small Piggyback cabinets can be placed on top of counters, and the Undercounter ones if you do not want to cut your workspace. Both Slimline and Piggyback cabinets can also be used in conjunction with the Standard cabinets for expanded storage. Manual vs. Self-Closing Door Styles: Flammable storage cabinets with manual-close doors are undeniably the economical choice. However, self-closing doors offer added protection in case of an emergency. 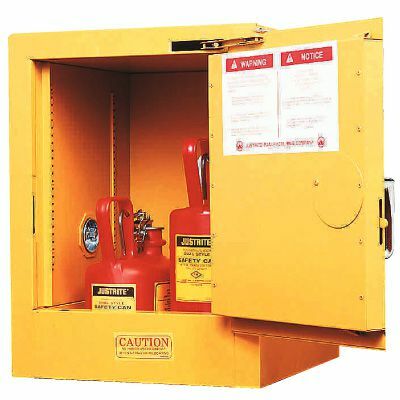 Safety cabinets with self-closing doors feature a fusible link that melts at 165°F and thus automatically shuts the doors in the event of a fire. Door style is usually chosen by preference except in states that follow the Uniform Fire Code (UFC) which requires the use of self-closing doors. How about safety standards? Our flammable cabinets are compliant with the two major standards everyone has to remember when it comes to safety storage. OSHA 29 CFR 1910.106 and NFPA Code 30 both demand safety cabinets to be designed and constructed in such a way that they can keep the internal temperature down to 325°F when subjected to a 10-minute fire test. The flammable cabinets should also be labeled with "Flammable - Keep Fire Away". What is FM Approval? FM Approval means the safety cabinet has been evaluated and approved to meet the industry’s published standards for safety and compliant with the laws specified for certain designs. FM Approval is a laboratory under OSHA's Nationally Recognized Laboratory program, and they actually publish lists of approved products for public reference.